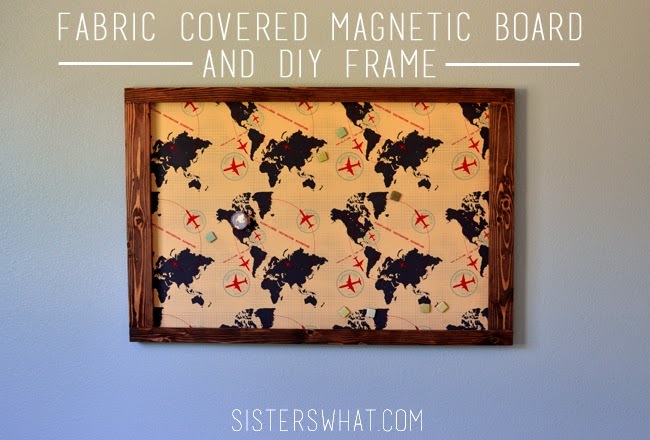 ' Fabric Covered Magnetic Board and DIY Frame - Sisters, What! Last week I shared this tutorial on the Ribbon Retreat Blog. Today I get to share it with you. Sometimes I feel like art projects and random papers are like ivy, they slowly creep all over the fridge until you can no longer see it. Thank goodness for the recycling bin, but Captain Awesome at the wonderful age of 3 is starting to become sentimental. So...we I decided we needed a place for all of his sweet scribbles and art projects. 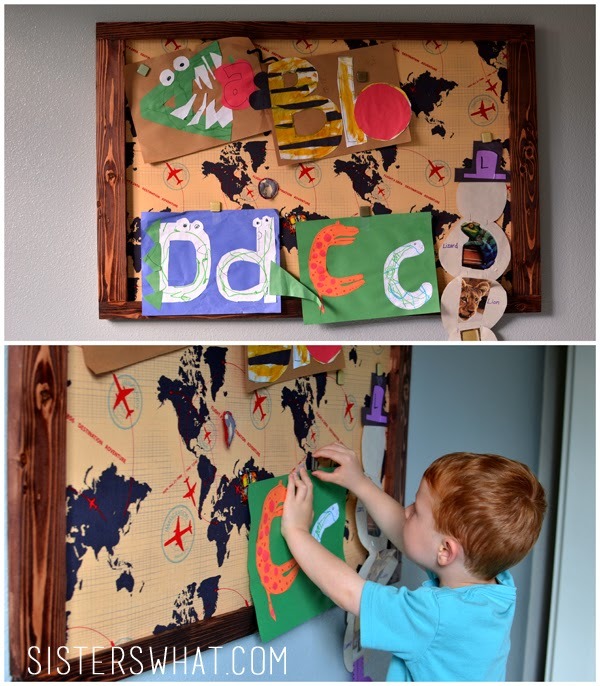 Solution: a magnetic board just for him. I also had this brilliant idea to make a frame for it, and I thought it would be super easy. That is, with the help of my husband. A lot of help that is. My wood shop skills are kind of rusty, so thanks to my wonderful and patient husband, he really helped me through this whole project. Galvanized Sheet Metal (NOT aluminum - take a magnet with you just in case) - any size you want. If you are using a premade frame then measure the frame and then find metal that is close to that size. You might need to get special scissors to cut the metal to fit your frame. |1| lay your piece of metal on your fabric. Cut fabric piece so it's 2-3 inches bigger all around the sheet metal. |2| Make sure your fabric is ironed perfectly. *do this step in the garage, other wise you'll be cleaning up sticky gunk from the carpet and have a unhappy husband. If you are in a dirty garage, use an old clean sheet to lay your fabric on. On the old sheet, place your metal piece. 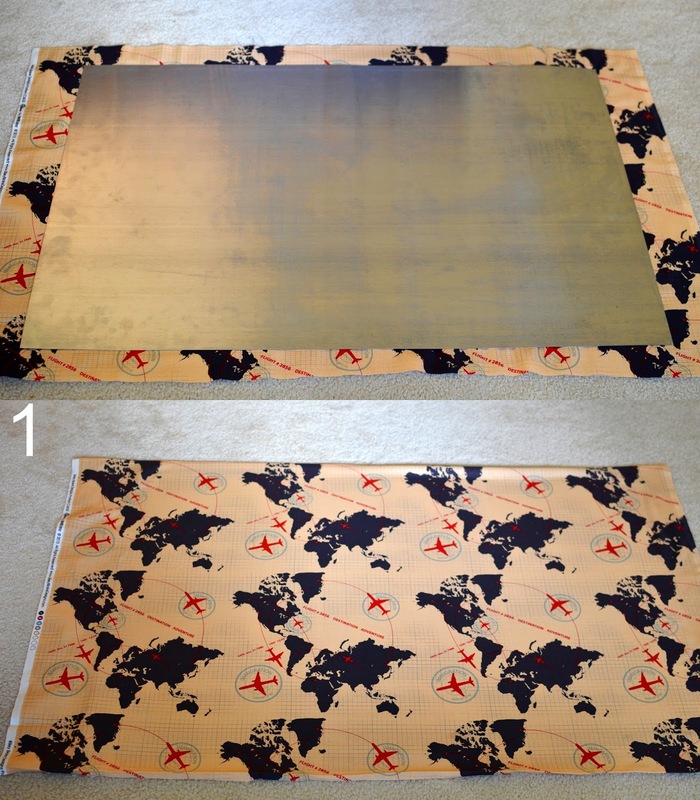 Starting from one side of the metal, cover with spray adhesive one third of metal at a time. Now as you spray the adhesive on, carefully place your fabric wrong side down and smooth it in place. Spray another third and place more fabric. Repeat until you have completely placed the fabric on. |3| now turn the fabric and metal over. Starting on the short edges fold your corners as seen in the above picture. Then spray with adhesive the edge and pull the fabric over tightly. Then do the same to the long side. You can do this anyway you like really, just make sure to the fabric is tight on the main side. This is the part in the 'choose your own adventure books' where you get to choose your own adventure! are you feeling pretty lucky right now? you should. are you brave enough? heck yes, if I can do it (with a little hubby help) then you most certainly can to! If you are going to use a picture frame, if the metal was to big for the frame, I believe you can get special scissors for around $8-10 that can easily cut the sheet metal. 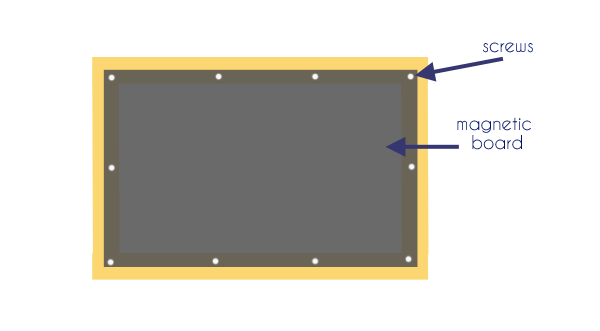 Now that the metal is the correct size, carefully remove the glass and place your metal inside. Then place back on the picture frame backing and your done. Wood: I was planning on doing 1x3 for all four sidez, but we had a 1x2 laying around and I liked the idea of doing 1x2 for the sides and 1x3 for the tops. 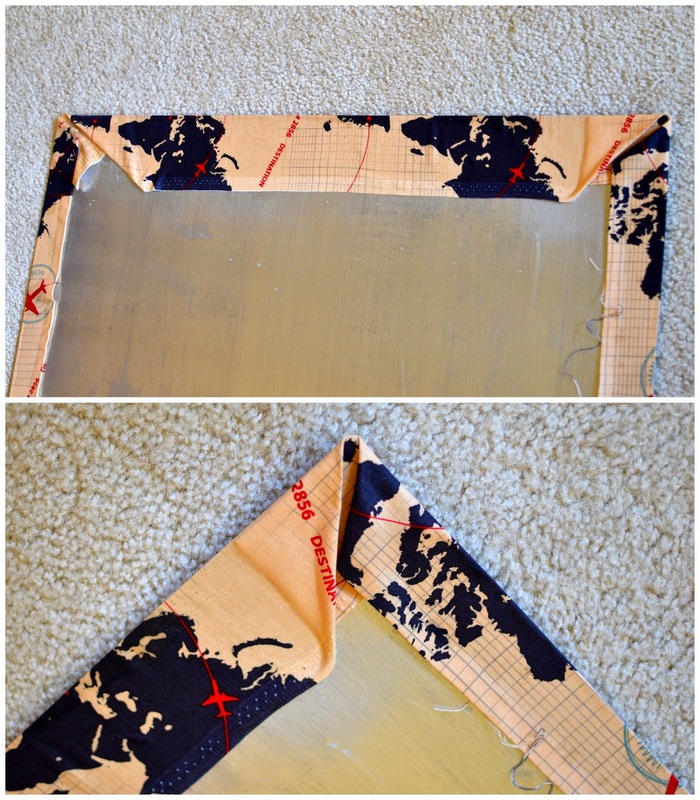 Originally I was going to make a frame as seen on the blog organize your stuff now. But because I decided to the different sizes of wood, that option was out. However, you can do that option if you like the more traditional look. See picture below to see what I did. 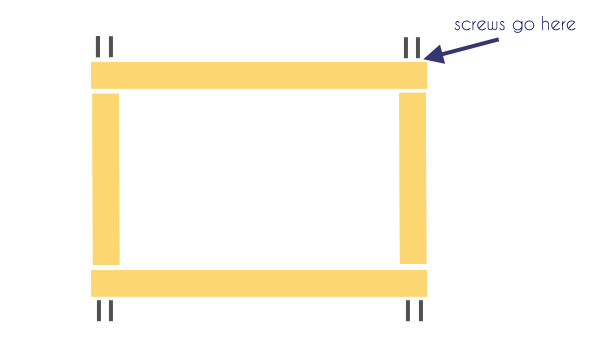 Cutting wood: We made the frame so that the metal would only overlap half of each side of the frame. 2 - 1x3s - 38"
2 - 1x2s - 22"
option a the most correct way to put a picture frame is to use a pocket hole jig - go here to see how to do this correctly. 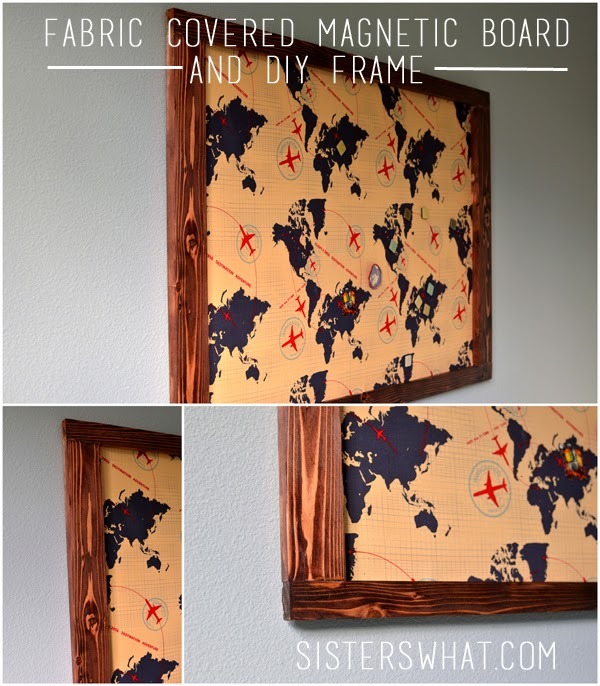 This allows you to put together the frame without any visible screws or screw holes. However, you have to purchase of of these jigs, and that wasn't something we wanted to do. option c: What we did - Start at one corner, join one of the 1x2 perpendicular to the 1x3. Clamp the wood pieces to a table for stability if you are able. Now using a drill bit and drill two holes for the screws. 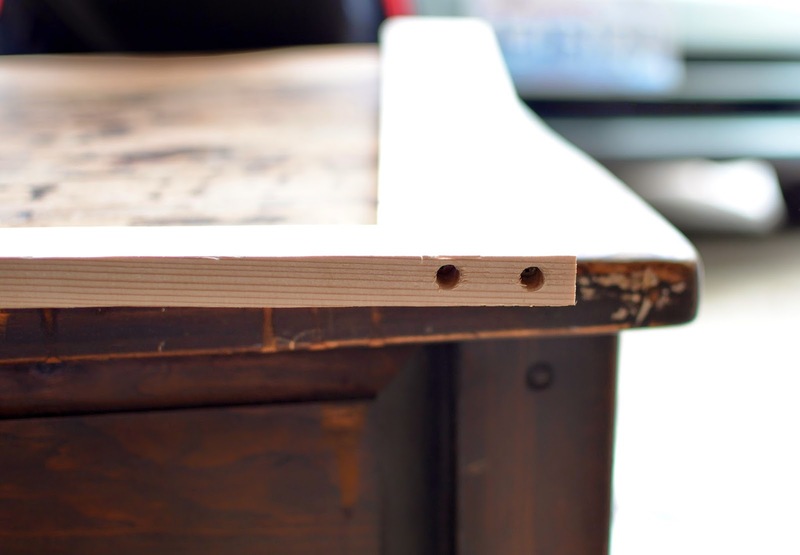 In order to properly counter sink the screw, without splitting the wood, using a drill bit the of the screw head, drill a hole 1/4 of an inch deep (see image below). Now your ready to screw your screws in. Do this for all four sides. wood filler and sanding: After screwing fill the holes with wood filler. Follow directions on package. I waited to sand after everything was assembled. 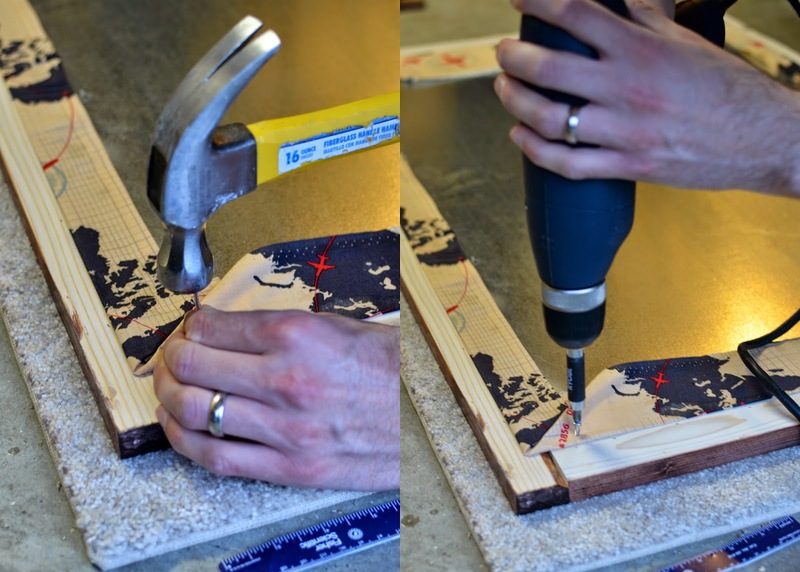 You can sand after cutting or after assemblage. 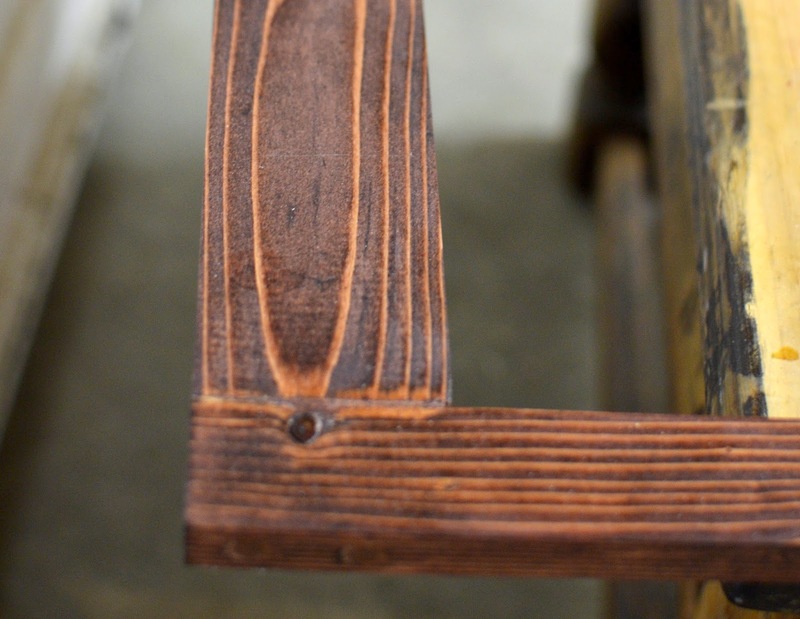 Stain or Paint: Before attaching the sheet metal, stain or paint the frame. I went with staining; I thought it would look great with the fabric I chose. Attaching the Metal: If you're still with me on this 'choose your own adventure', then shout for joy because we are almost done. I know this was the harder option, but you're going to feel sooo good after your done it's going to look great! Ok enough talk. Place the sheet metal on the back of your frame so that it is perfectly spaced. In order to get through the metal, you're going to want to use a nail and hammer a hole through the metal. Then grab a screw and drill that screw into the made hole. Do this all around the frame. As you can see above, we did a generous amount of screws to hold the magnetic board in place. Now attach some heavy duty hangers and hang it on your wall and you are done!!! *can you spy what country boba fett is on?